This weekend is finally supposed to be warm and sunny. It has been a dreadful couple of weeks here down south — rainy, muggy, and gray. Finally some sunshine! and with that a fresh and tasty appetizer. I challenge you this weekend to eat outside and make these tomato bites —a perfect bite of juicy tomato, dense mozzarella, basil, and olive oil. You won't regret it! Don't forget to chill before serving. 2 Make another slice on the opposite side of the tomato and scoop out the pulp inside using a mellon baller or small spoon. Be careful not to puncture the skin on the bottom. Don't worry about what it looks like because it will be stuffed. 3 Arrange tomatoes on aluminum foil, all standing upright and hollow. Sprinkle all the cups with kosher salt and pepper. 4 Place cubed mozerella in each cup. You can experiment with the size of the mozerella but I prefer the tomatoes to be really stuffed! 5 Drizzle olive oil over all the stuffed cups. 7 Transfer the bites onto a serving platter and chill until ready to serve. GORGEOUS photo! I wish I liked tomatoes because they look delish! These look great. Perfect for a party. Perfect cookout finger food. And healthy too. Great photo! Those are the most delectable baby tomatoes I have ever seen! Stunning! I'm in love with these, I may make them next week for my staff luncheon! These tomato bites are adorable and sound absolutely scrumptious! Simple yet so easy & so delicious appetizers! yum! I love this idea. Such a cute and creative take on a caprese salad. So cute! I'm always looking for fun starters and these look great-- thanks for sharing! Absolutely gorgeous idea! I always eat regular caprese salad with just slices of the tomatos and monzerella but this looks the perfect little serving! 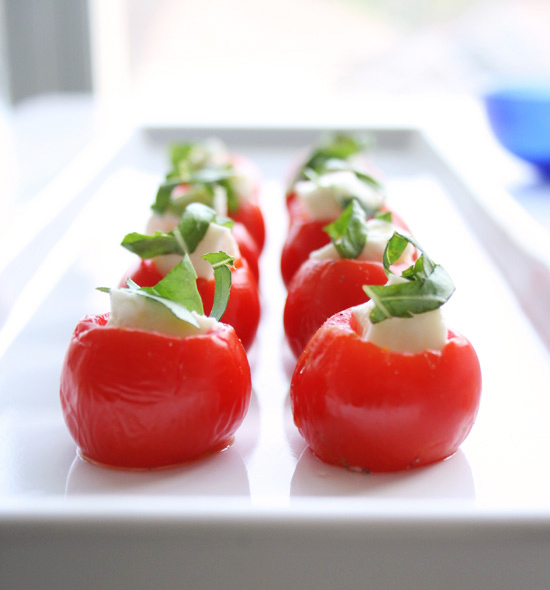 I love caprese salad, and this is such a great little variation! I love how it's all one bite :)Would be perfect for a party. Very nice done! Will have to include this one next time I'm having friends over. I made a variation of these over the weekend, and they were so good! Thanks for such a great idea. I love the cherry combine with chocolate or with any recipe, they are simple delicous. That is why This blogs catch my attention and i think it is very helpful, i am very curious to know different way to prepare the cherry. Actually i was looking for information about how to buy viagra by internet and i found this blog. Absolutely interesting. I must to say all this information is really amazing.